We’re kicking off April’s theme with a bizarre tale of failed socialist revolution and missing bathroom keys. Yes, it’s the little-known month-long Bavarian Soviet Republic of 1919. It is more literally described as the Bavarian Council Republic, but “Soviet” is really a more accurate descriptor. However, the process that turned the multi-party democracy of the Weimar Republic into the single-party dictatorship of Nazi Germany was not inevitable. Democratic Germany also faced left-wing threats to its existence, namely from the Soviet-aligned KPD (Communist Party of Germany). In a way, Germany was a natural candidate for a communist revolution. The founders of the communist philosophy, Karl Marx and Friedrich Engels, were Germans themselves, and the economic chaos that befell Germany at the end of World War I created the perfect situation for an armed takeover by leftists promising benefits to the masses that the old imperial government had denied them. And indeed, one of the very first threats to the new government in Berlin led by the center-left Social Democratic Party came from KPD insurrectionists in Munich, the largest city in southern Germany. In November 1918, when the imperial government was dissolved and Germany surrendered to the Allies, control over the Bavarian state government was assumed by Kurt Eisner, a politician at the head of the USPD (Independent Social Democratic Party), a left-wing splinter of the already socialist SPD. Although a left-wing socialist himself, Eisner rejected the idea of communist revolution and worked within the new democratic framework set up by the SPD in Berlin, stepping down when the USPD was voted out of power at the beginning of 1919. More extreme left-wing elements in Munich did support a communist revolution, however, and Eisner’s assassination by a young right-wing aristocrat just after his defeat in the polls agitated these activists to more decisive action. 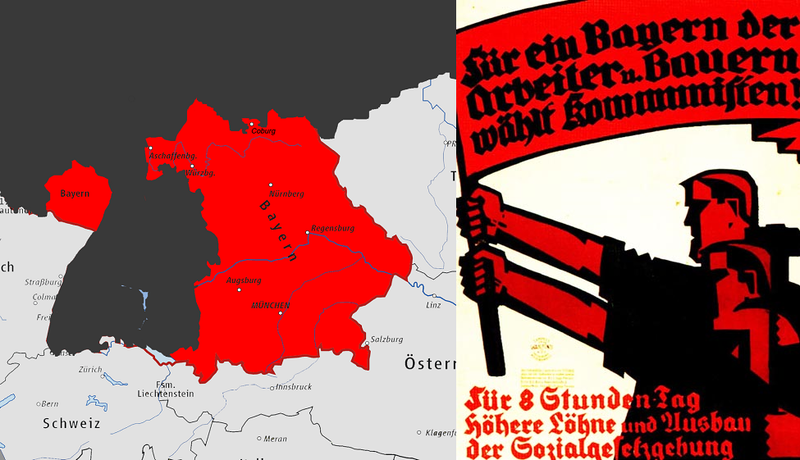 On April 6, 1919, USPD politician and modernist playwright Ernst Toller led a takeover of the Bavarian state government together with other left-wing socialists and anarchists, who declared the establishment of an independent Bavarian Soviet Republic. Toller’s government naturally made contact with the Bolshevik-controlled government of the Russian Soviet Federative Socialist Republic (yeah, this name is a real mouthful.) To give you an impression of the general approach of this newly minted government, its foreign minister would complain to Vladimir Lenin that the deposed minister had fled Munich with the key to the ministry toilet in his pocket. As though this was something Lenin could do anything about, even if he wanted to. Considering the fact that Lenin was then locked into a civil war with the monarchist Whites and their democratic and socialist “Pink” sort-of allies, we have to assume he didn’t pay this complaint much mind. Toller’s government would only last six days before being taken over by a straight up capital C (or more properly in German, capital K) Communist, a St. Petersberg transplant into Germany no less, named Eugen Levine. A former member of the Social Revolutionary Party of Russia and a former prisoner of the Russian Empire, Levine presumably had stronger revolutionary credentials than the weirdo playwright Toller. Sadly for Levine and his new government, this wouldn’t help them spark a successful communist revolution throughout Germany as they had hoped. 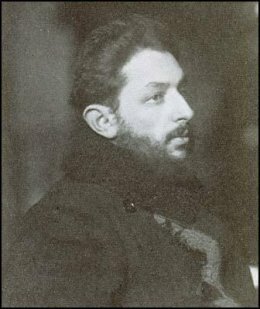 Eugen Levine, looking like a proper revolutionary dude from the early 20th century. Or like a modern-day college town hipster. Levine and his commissars began to put into place the kind of plans you’d expect – for property redistribution, the creation of an official Red Army, reforms to education, and so on. They even had the chance to carry out a few executions of anti-communist figures in Munich, including a prominent nobleman (though not the one who had murdered their socialist cousin Kurt Eisner.) However, the communist party in Munich only lasted for about three weeks following Levine’s coup. The solidly republican Social Democratic government in Berlin headed by President Friedrich Ebert decided to order paramilitary units (the Freikorps, whose members unlike those of the SPD leaned hard to the right) to bring Munich back into the Reich. The tens of thousands of regular army and irregular Freikorps units steamrolled the Munich Red Guards and soon captured Levine and co. The month-long Bavarian Soviet Republic was dead, and with it the last serious left-wing threat to the Weimar Republic. In these old group photos of revolutionary militias, there are always a few guys lounging on the ground in the front as if they were at the beach. So how did it all end? The figures in our strange story met varied fates. Eugen Levine was made the chief defendant of a show trial and was executed a mere month after his capture (one must assume without any appeals process.) Ernst Toller, who had control of the Bavarian state for just under a week, was sent by the German authorities to prison for five years and later departed for the United States, where he would eventually commit suicide, but not before writing some plays that gained acclaim. Many of the Red Guard fighters themselves would be killed by Freikorps and allied soldiers, either during the fighting or in later extrajudicial executions. 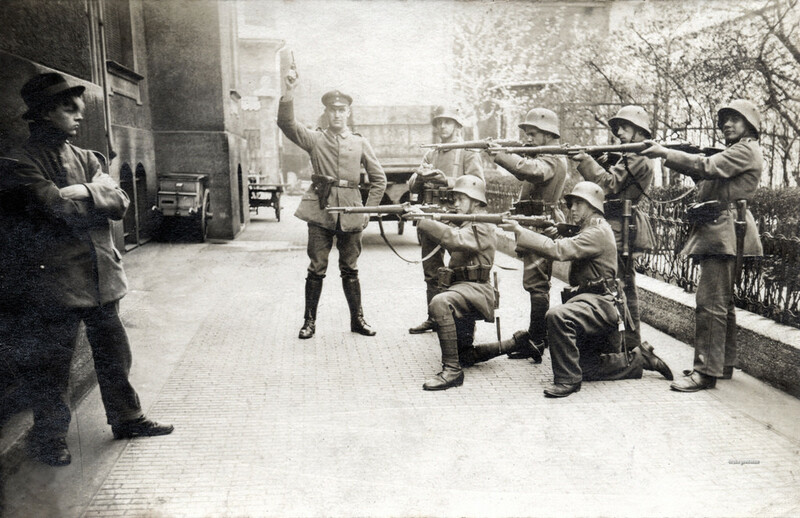 This is supposedly a photo of a communist rebel in Munich being executed by firing squad, but it’s obviously staged. Dude looks like he just came from the catwalk at a German fashion show. 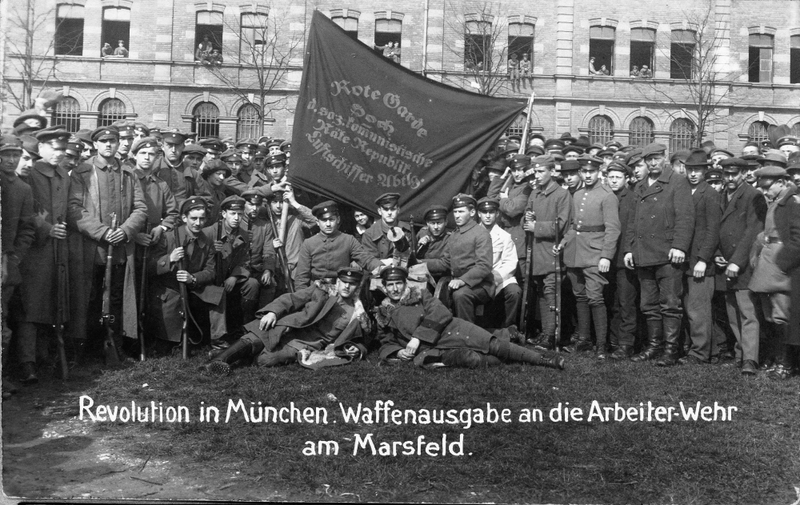 The USPD fell apart soon after the Bavarian fiasco, but strangely enough the KPD, despite its participation in both the Munich rebellion and the January 1919 Spartacist revolt in Berlin, would continue to exist in Germany. Although the KPD remained a Soviet-aligned party with the goal of destroying the Weimar Republic, it switched from revolutionary to democratic tactics, running candidates in elections until its dissolution by the Nazis in 1933. 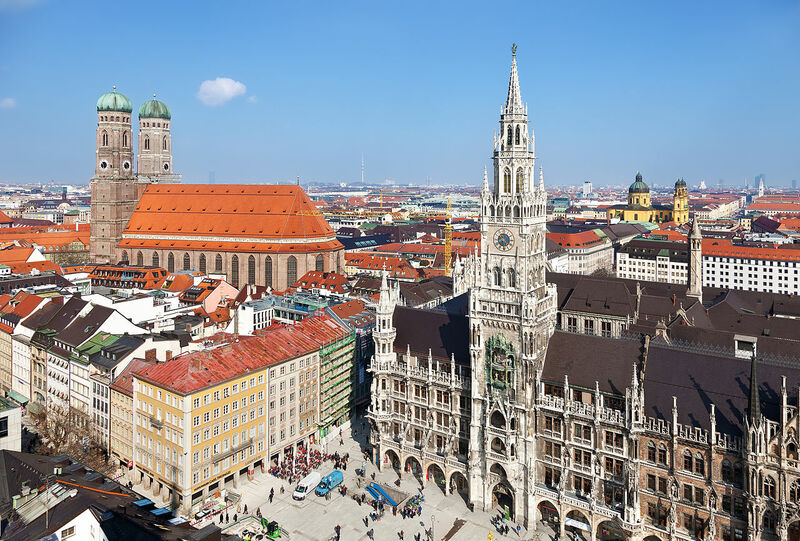 And Munich itself would turn from a center of left-wing extremism to one of right-wing extremism, becoming the birthplace of the Nazi party and the adopted hometown of its leader, Adolf Hitler. Well, that was a dark one. With the left- and right-wing coups and hyperinflationary currency and political murders, early Weimar Germany was a bit like the Chaos ending of a Megami Tensei game, minus the literal demons. No, of course I can’t resist the reference. This ended like a Megami Tensei game and Hitler was a boss in Persona 2. Is Atlus not telling us something? I haven’t played Eternal Punishment, but I’ve seen the Hitler screenshots. Rasputin is also in one of the Devil Summoner games. Weird stuff. Previous Post 6 hot tips to kill your law school finals! !